La ceinture, le plateau et le gradin de ce meuble sont ornés de dix-sept plaques de porcelaine à bouquets de fleurs sur fond blanc dans des encadrements verts et or enchâssés dans des montures de bronze. Neuf plaques portent la lettre date n de l’année 1766 et certaines sont signées des peintres de fleurs Xhrouet, Catrice et Pierre jeune. L’arrière du meuble est marqueté de branches de fleurs en sycomore et amarante. Le tiroir plaqué de bois de rose forme écritoire. C’est le marchand mercier Simon-Philippe Poirier qui fit appel à Carlin pour lui confier la fabrication de ce type de meubles agrémentés de plaques de porcelaine de Sèvres qu’il commandait à la manufacture. 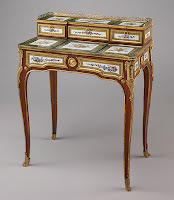 Onze tables de même modèle dont les plaques sont datées entre 1765 et 1774 sont répertoriées, notamment deux dans la collection Rothschild à Waddesdon Manor, et deux autres au Metropolitan Museum de New York. 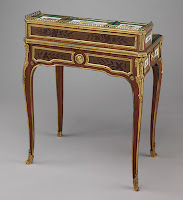 C’est l’antiquaire Seligmann qui vendit ce meuble à Moïse de Camondo, provenant des collections du comte d’Aubigny et du général baron de Charrette. Poirier avait livré une table semblable à Madame Du Barry et la comtesse d’Artois, belle-sœur du roi Louis XVI, en possédait également une. Martin Carlin is known to have made at least eleven such bonheurs-du-jour, seven of which were signed by him. 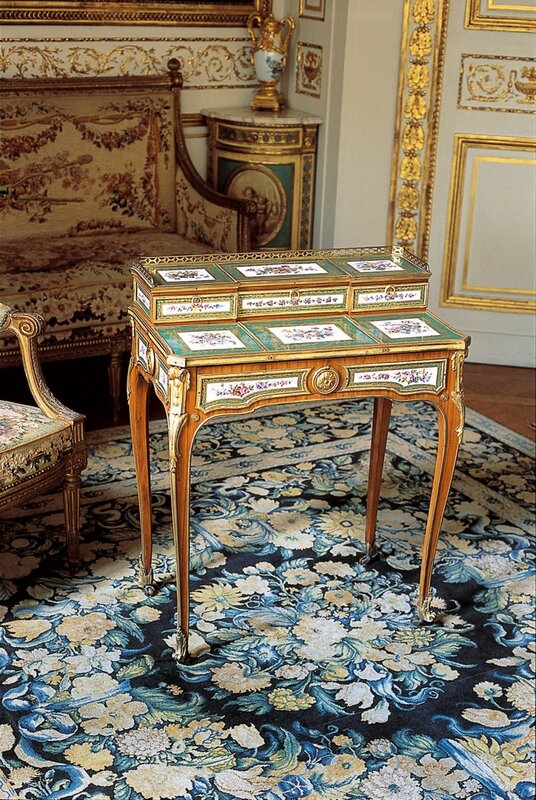 Raised on four slender curving legs, these tables are mounted with seventeen Sèvres plaques painted with delicate floral ornament, specially ordered for this purpose. Twelve of the plaques on this table bear the date-letter for 1768, the year that Madame du Barry, mistress of Louis XV, bought hers from the marchand-mercier Simon-Philippe Poirier. It is possible that this desk was the one that belonged to her. 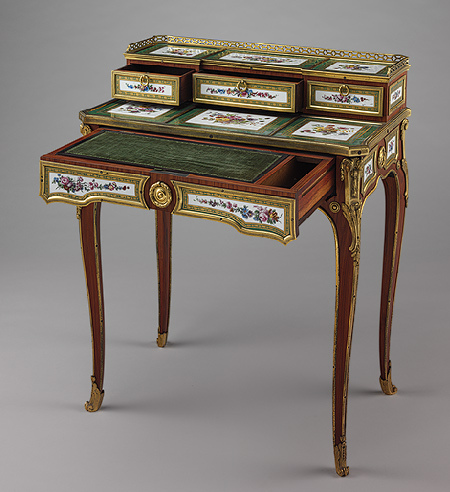 The name for a lady's writing-desk, so called because, when it was introduced in France about 1760, it speedily became intensely fashionable. 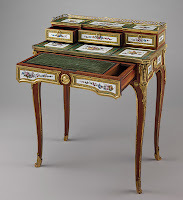 The bonheur du jour is always very light and graceful; its special characteristic is a raised back, which may form a little cabinet or a nest of drawers, or may simply be fitted with a mirror. The top often surrounded with a chased and gilded bronze gallery, serves for placing small ornaments. Beneath the writing surface there is usually a single drawer, often neatly fitted for toiletries or writing supplies. The details vary greatly, but the general characteristics are always traceable. The bonheur du jour has never been so delicate, so charming, so coquettish as in the quarter of a century which followed its introduction. 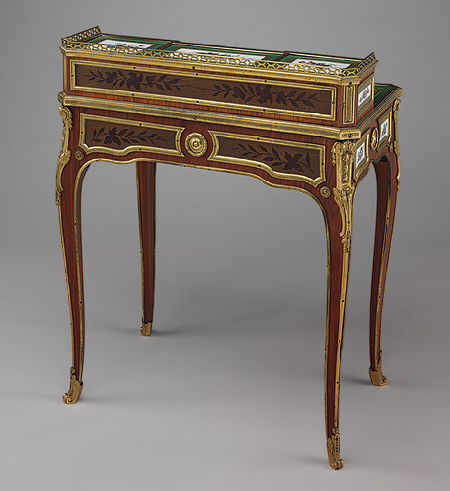 Early examples were raised on slender cabriole legs; under the influence of neoclassicism, examples made after about 1775 had straight, tapering legs. The marchand-mercier Simon-Philippe Poirier had the idea of mounting bonheurs du jour with specially-made plaques of Sèvres porcelain that he commissioned and for which he had a monopoly; the earliest Sèvres-mounted bonheur du jours are datable from the marks under their plaques to 1766-67. 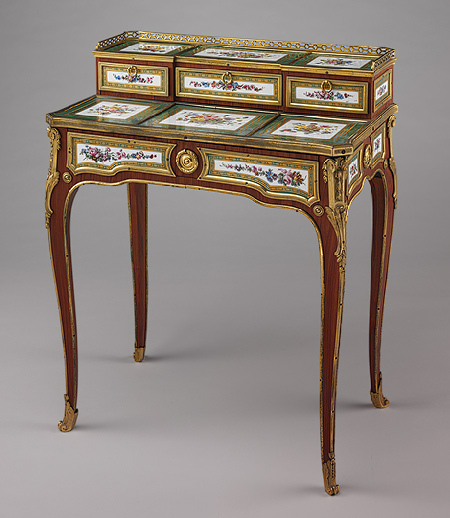 The choicer examples of the time are inlaid with marqueterie, edged with exotic woods, set in gilded bronze, or enriched with panels of Oriental lacquer. F.J.B. Watson once suggested that "its somewhat obscure name perhaps refers to its sudden and astonishing success." (Watson, Louis XVI Furniure [London: Tiranti] 1960:23, note 8); the first appearance of the term bonheur du jour that he identified was in 1770, in an inventory of the duc de Villars' property at Marseille. Svend Eriksen, Early Neo-Classicism in France (London: Faber & Faber) 1974, plate 111, bonheur du jour stamped by Martin Carlin in the Musée Nissim de Camondo, Paris; another with plaques dated for 1766 is in the James A. de Rothschild collection, Waddesdon Manor.